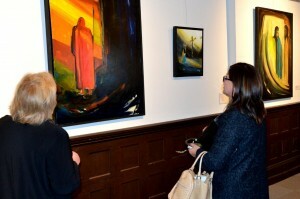 The 27th Annual Friends of Polish Art Fine Arts Competition was on display at the Galeria of the Polish Mission from October 7-26. Also on display was a solo exhibit of the annual competition’s 2012 juror, Dennis Orlowski. An opening reception honoring both the competition artists and Mr. Orlowski took place on Sunday, October 7th at the Galeria. The Galeria was filled with artists and friends enjoying both exhibits. The competition exhibit grew in size since last year, with a grouping of very high quality entries. Awards were presented by Chancellor, Reverend Monsignor Thomas C. Machalski, Jr., the President of Friends of Polish Art Carol J. Surma Esq., with a special Polish Mission Award presented by the Director of the Galeria Evelyn Bachorski-Bowman. Mr. Orlowski spoke to each award winner telling them why he chose their piece before each artist said a few words about their winning entry. Dennis Orlowski’s large scale mural on canvas of Our Lady of Czestochowa became the focal point of the Galeria. This stunning mural was the first image seen upon entering the Galeria, and was commissioned 25 years ago for Pope John Paul II’s visit to Hamtramck on September 19, 1987. It served as the back drop for the pavilion from which the Pope addressed the crowds. The exhibit is a grouping of Dennis’ many large scale mural projects and smaller, easel paintings of still life and portrait themes. Juror Orlowski presented a Gallery Talk on Sunday, October 14, 2012. Guests had the opportunity to learn about the process he follows while creating his murals and paintings. Dennis took the group around the Galeria and shared stories about the art work installed in his solo exhibit and gave a live sketching demonstration with attendee Brian Malski, 2nd Vice President of FPA, as his model.